My husband and I have recently relocated, and are temporarily staying at an Airbnb until we can move into our new home. As soon as we arrived at the Airbnb I scouted out the kitchen. Sadly it was not very well equipped – no mixer, no scale, no baking trays, not even a mixing bowl to be found! My fingers were twitching to get baking though, so I racked my brain for a simple recipe that requires next to no equipment to make. I came up with this old favourite of mine, a super quick and easy recipe that delivers extremely yummy results. All you need is a saucepan, a cup, a tablespoon and some cupcake cases. 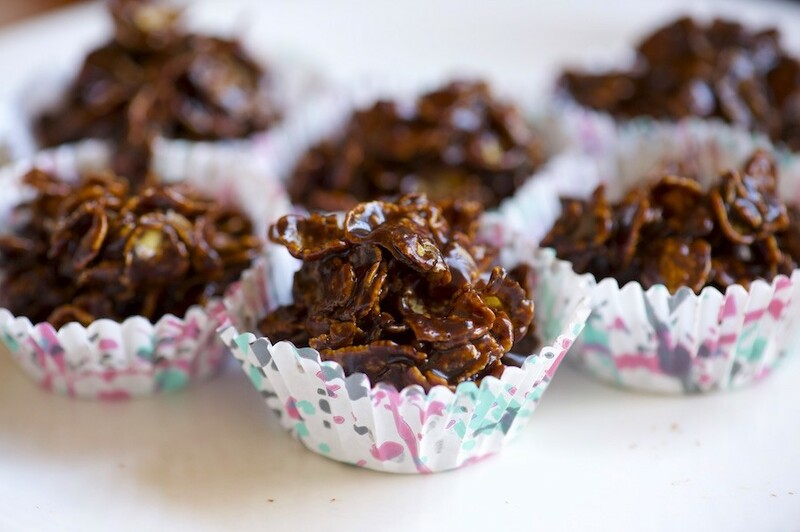 These crunchy chocolaty treats are perfect to make whilst on holiday – they are eagerly gobbled up by both kids and adults, and take only 10 minutes to make. Plus there are only a few dishes to wash up! Melt the butter and syrup together in a saucepan on medium heat. Add the cocoa and mix well until smooth. (Alternatively you can do this in a bowl in the microwave on low power, stirring every 10-15 seconds until melted). Stir in the cornflakes and mix until evenly coated. Divide the mixture between 12 cupcake cases. Leave to cool for 1 hour at room temperature to set slightly, or place in the fridge for 20 minutes to speed this up. The chocolate coating will not set hard, it will still be quite sticky. I love these and so do my grandchildren! Thank you! I was just looking fr a recipe for this a few days ago. Perfect.